In April, Johno Montgomery, our BikeRescue License Manager, headed towards Alice Springs. There he provided the BikeRescue licensed model to the youth workers and the youths at The Gap Youth & Community Centre. BikeRescue License was developed to increase the number of people that will be able to participate in BikeRescue locally. Adult participants are trained to be ‘BikeRescue Mentors’ to deliver BikeRescue to the kids. 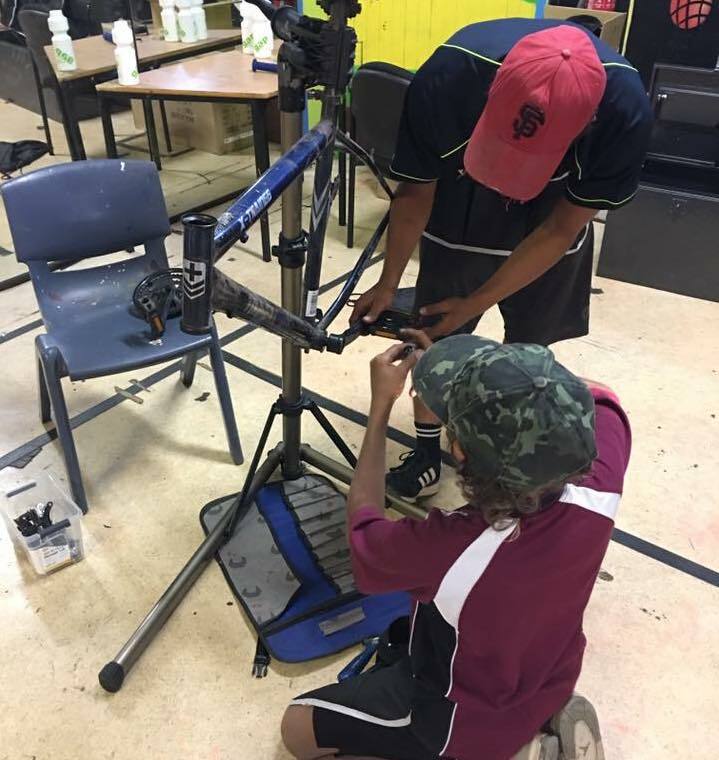 The Gap Youth & Community Centre have worked hard to engage the children and youths in Alice Springs to be involved with activities that help them grow and develop. Aboriginal Corporation is a community owned group who had a vision of of strengthening future generations through various forms of learning and creative opportunities. Johno’s visit to Alice Springs lasted for 5 days and had a total participation of 5 adults and 6 kids. Johno trained the adult mentors in the morning to deliver the BikeRescue Program, and facilitated the program between the adult mentors and the kids in the afternoon. Practically the whole town was excited and enthusiastic about BikeRescue! At the start of the week, some participants were unsure about the BikeRescue Program. However, things soon changed. They completed their bikes mid week and proudly rode around town, displaying their bikes. We can’t wait to hear more stories from our partner’s about BikeRescue’s impact on the youths at Alice Springs! If you think BikeResuce can be beneficial to your community, let us know! On Tuesday night, Dismantle was announced as a winner of one of two Impact100 Primary Grants. Impact100 is a philanthropy initiative where 100 people donate a minimum of $1,000 each and then decide who to give it to. It’s a hugely exciting win, because it means that we get $100,000 to put towards getting our ReNew Properties project up and running. By 2020, we'll be putting 40 BikeRescue grads a year through a traineeship that will complete the pathway for youth people in tough spots from falling through the cracks to proper employment and education. ReNew Properties is something we’ve been working on for a couple of years. It’s a professional and commercial property maintenance business with the sole purpose of providing BikeRescue graduates with paid work experience to help them get their life back on track. At the moment we do the same thing with BikeDr, but they can only host 10 kids a year out of 400+ BikeRescue graduates. the moment we do the same thing with BikeDr, but they can only host 10 kids a year out of 400+ BikeRescue graduates. The 100k grant will allow us to buy the gear and hire the right staff to get the project off the ground. Starting from early next year, three or four trainees will meet at our headquarters in West Leederville each morning for a coffee and brief, hop in a van and, working with our Property Maintenance Staff, do the jobs that are too small for a tradies or business, but perfect for entry-level skill sets. And then, when something happens in the trainee's life, like it does way too often, we'll always have our youth team on-hand to provide the support they need. We already have a list of clients waiting for us to get started. Each of them wants to provide employment in a way that creates social change, but can’t find anything in Perth. We’re super excited that we now have the money to provide that service. Massive thanks to everyone involved in Impact100! Dismantle CEO Pat Ryan (looking pensive on the right, there) got a few soft, computer hands dirty recently, running a corporate team building workshop with staff from City of Mandurah. The ReCycle-a-Bike Team Challenge was part of a team building day for their HR and Organisational Development departments. The group of 13 recycled four bikes, which were handed over to local charity, Peel Youth Services, to be donated to at-risk teenagers. Dismantle’s Recycle-a-bike Team Challenge is a three-hour program that can be delivered during the work week, either at a venue chosen by the client, or at our workshop, which can accommodate groups of up to 15. They’re also really flexible. Group size can range from 12 people, all the way up to 100, and the workshops can be customised to meet any key organisational or team building goals clients want to focus on. Additionally, the ReCycle-a-Bike Team Challenge has really great social outcomes. Bikes recycled during the sessions are donated to a local charity, and proceeds support BikeRescue. It’s also an excellent way for Dismantle to establish and strengthen relationships with the participating organisations across some of our other initiatives. For example, the Challenge may open discussions for Dismantle to become a Workplace Giving Program charity partner, if clients have such a program in place. If you’re interested in getting one going for your team, or know someone who might be, get in touch with Darren on 0431 706 851 or at darren@dismantle.org.au. Westpac Foundation, through the Community Grants program, has enabled two BikeRescues! The Foundation offers grants to not-for-profit organisations and social enterprises, specifically those taking fresh approaches to solving Australian’s complex social problems. Dismantle makes a pretty slick fit, and we’re excited to already be putting the money to work helping out kids doing it tough. Half of the grant is going to a BikeRescue for vulnerable young people aged 16-20 from Foyer Oxford, a housing and support service. Foyer Oxford is part of the international Foyer Movement and is a special kind of awesome. The idea is to put young people in tough spots in the centre of things, not out in the fringe suburbs, and support them with educational and training opportunities while creating an ‘aspirational’ community around them. Over time, the residents secure sustainable employment and independent accommodation, creating the positive outcomes for the long term. We are very proud to partner with such a forward thinking program. Foyer Oxford is located in a beautifully designed building on Oxford Street in the heart of Leederville, right next to the CBD. It’s is run by a consortium of three organisations: Foundation Housing Ltd, Anglicare WA and North Metropolitan TAFE. Together, they offer 98 residents housing and support, as well as access to a diverse range of education and work opportunities. Westpac’s support has allowed us to run our program with 12 residents from the complex, starting from the beginning of October and will running through until mid-December. Approved and set up by Foyer Oxford manager, John Thomson, the goals for the program are to increase confidence in participants, create a sense of achievement, and build interpersonal effectiveness and work capacity. The second half of the money will be put to use in Term 1, 2019, supporting a program with a school or youth network in a low socio-economic area of Perth. It’s a generous contribution from Westpac Foundation, and one we can use to really effectively turn around the lives of vulnerable kids in tough spots. Thanks heaps, Westpac!